on a new rotary cutter. 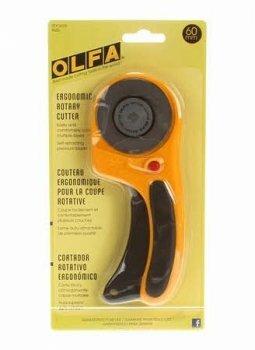 This 60mm Deluxe Rotary Cutter features OLFA's new ergonomic design providing a comfortable and positive grip. Simply squeeze the handle to engage the blade. Dual-action safety lock allows the user to lock the blade open for comfort and closed for safety. 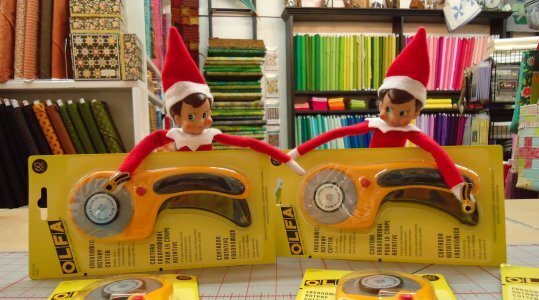 The 60mm OLFA rotary cutter is specially designed to cut through multiple layers of fabric and difficult materials. The blade is made of high quality tungsten carbide tool steel for unparalleled sharpness and superior edge retention. Designed for both right- and left-handed users. 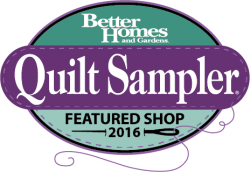 so you can get to sewing faster! Want this added to your Elf Stocking? Stop in today, call the shop or reply to this email. We will let the boys know how many to wrap up tonight.